In the summer of 2016, I decided to head for the high latitudes on my Bristol 56, Resolution. Anticipating this might be my last northern cruise, I had a number of conversations with the crew about our goals. Most of us had done one or more cruises together, and we came up with several destinations we thought we’d like to visit. One of the most intriguing, not least for its symbolism, was Resolution Island in Hudson Strait. Another popular choice was the Torngat Mountains of northern Labrador. As our early July departure neared, we began to favor a loosely defined goal of going as far north as we comfortably could in the six weeks or so that fit our various schedules, expecting this would get us into the best part of the Torngats. Right away, this strategy showed its worth, as the northbound crew of Paul Bushueff, Skip Garfield, Larry Hall and I all had to wait out a two-day nor’easter before we could even leave my home port of Marion, Massachusetts. Our reward was three days of easy powering to the Bras d’Or Lakes on Cape Breton Island with clear visibility the whole way—a first in my couple of dozen trips along the Nova Scotia coast. Although we each had a CANPASS document that would allow clearance into Canada by phone, we were also armed with the recommended polar bear defense of a 12-gauge shotgun, and had to show this, as well as its documentation, in person to the customs officers at St. Peter’s. Larry, Skip and Paul are all experienced with firearms, and Larry was designated as our “bear warden,” officialdom’s euphemism for the person with the gun. We stopped that night in Johnstown Harbour, a favorite among the many snug coves on Bras d’Or Lake, and then set out again by way of the Great Bras d’Or Channel, which to me always seems like the beginning of the transition to the “northern” Maritimes. After that, with strong winds in the forecast, we put in at Dingwall, the closest shelter to Cape North, to wait for better weather: and what a splendid “port in a storm” it was—a 400ft-wide lake that protects you from even the strongest wind gusts after you’ve made your way past the large commercial basin and up a narrow but deep creek. 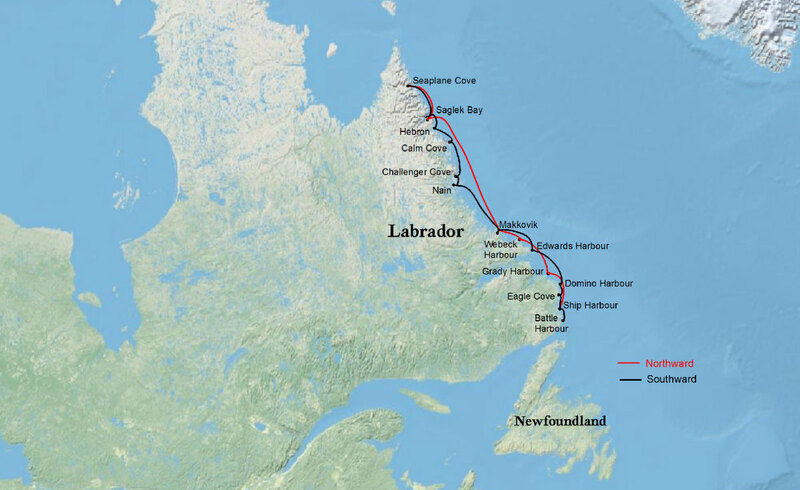 Next day, with the help of a fair, gentle breeze, we headed north across the often lumpy Cabot Strait into the Gulf of St. Lawrence, where we enjoyed remarkably good visibility all the way to Battle Harbour, Labrador. After that came beautiful Horsefly Cove at the head of Ship Harbour, where Resolution had ridden out a storm 10 years before. By now icebergs were beginning to show up in force, riding the south-going Labrador Current. I measured one with a sextant and radar at a new (personal) record of 251ft high. 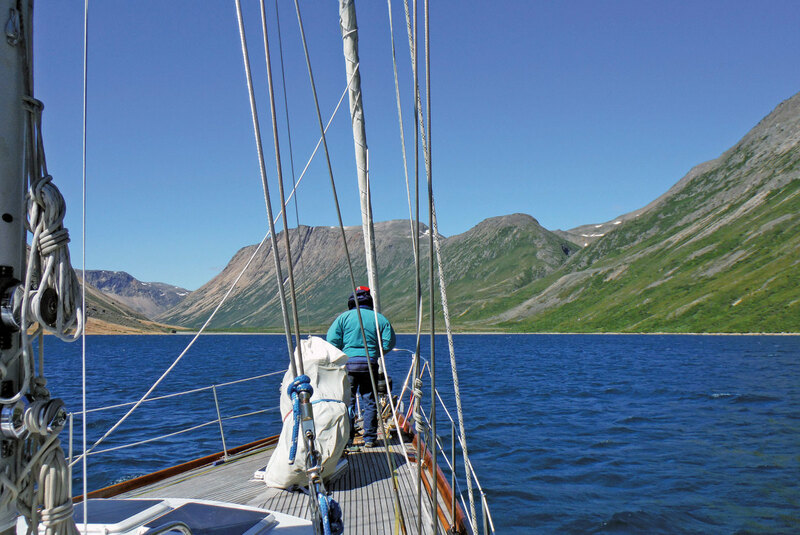 Three long day trips after that (with overnight stops in Grady and Webeck harbours) found Resolution in Makkovik, a favorite fuel and water stop, which was followed by an overnight sail to Saglek, which put us solidly among the Torngats. 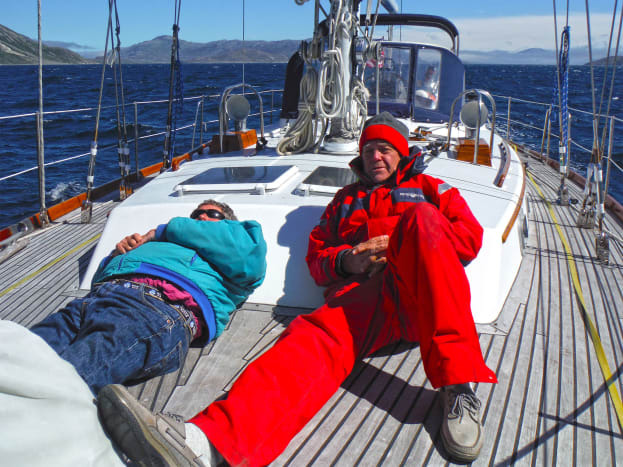 The overnight was fast but more adventurous than I had intended, with strong wind, big seas, more icebergs and fog. I had been in touch by e-mail with fellow Cruising Club of America (CCA) member Joe Hoopes (who sails the Little Harbor 75, Palawan) and he had offered some ice “wisdom” that included heaving-to in “bergy” areas whenever any two of the three following conditions were present: waves, darkness and fog. I think this is good advice, though I didn’t follow it. St. John’s Harbour in Saglek Bay serves as the base camp for the Torngat Mountains National Park, and the park staff there expect visitors to check in with them before going farther north. They also offer some limited supplies, though fuel is a heart-stopping $20 per gallon. Though the camp had been open for a week, no visitors had yet arrived, as nearby Nain airport had been solidly fogged in. The land at the head of the arm slopes gently up a large valley, making it ideal for walking. There are also many ruins from an earlier Inuit settlement around the mouth of the stream there. With increasing numbers of polar bears in recent years, hiking in this area presents the dilemma of self-defense. Park rules prohibit firearms ashore, but our crew was unanimous in its decision that safety was its main concern—we’ll leave it at that. South of the park, in Hebron, the impressive Moravian mission building has been fully restored on the exterior, and work is continuing on interior details. The building was prefabricated in Germany in 1829, shipped in parts, reassembled on-site and completed in 1837. The restoration seems a huge effort for such a remote area, but there is an interpreter and a small dock for dinghy landings, and a number of cruise ships visit each summer. A week earlier a ship with over 200 students had apparently stopped by. Continuing on from there, we stopped in at Nain, where we also made a crew change, with Nancy McKelvy, Peter Stone and John Winder coming aboard for the return trip. Nain has undergone a remarkable transformation since the Inuit provincial government of Nunatsiavut was established there in 2005. With a new government center and clinic, as well as an active fish plant, many more are now employed, and fewer neglected children roam the streets. The Atsanik Lodge even has Wi-Fi, which allowed me to download those same charts I had been envying on Larry’s and Paul’s iPads. Much of northern Labrador was re-surveyed in the 2000s, so for a significant portion of this coast, you now have a “pathway” of soundings perhaps a half-mile wide, instead of the single track shown on earlier charts. Nonetheless, the stretch between Nain and Makkovik remains a “rock garden,” some of which we got to see far too closely following a slight navigational mix up. Unfortunately, along the southern Labrador coast, Resolution met with a spell of bad weather, thanks to a deep low offshore, with strong southeast winds, fog and a big swell rebounding off the cliffs on shore. Domino Harbour and Eagle Cove, however, proved to be another couple of cozy refuges in the storm, and by the time we returned to Ship Harbour, it was clear enough for Peter to get out his watercolors and do a little painting. After that, Battle Harbour was our last port in Labrador. Though the “new” pier there has been destroyed by ice, it is still a fine place to spend a day, with great walking trails all over the island. As we said farewell to Labrador, I teased John Winder about not going for a swim, as he had done once in Greenland. Truth be told, though, the water in the Labrador current is much colder than along the west coast of Greenland. I sometimes wonder whether the Strait of Belle Isle wasn’t named in the same spirit of optimism, or perhaps marketing, as is said to have been the case when the Vikings named Greenland. The only thing that is consistent about it is its inconsistency. Our transit wasn’t too bad, but with a headwind blowing against a fair tide, the chop was so steep our speed actually improved when the tide turned against us and the seas settled down again. In the end, we made it as far as Bonne Bay, Newfoundland, before the southwester really started cranking, forcing us to have to wait another three full days, mostly at nearby Norris Cove. Our patience, however, was eventually rewarded with a lovely sail in a moderate nor’wester down the coast and back across the Cabot Strait. Early in the morning, I was able to see Cape Ray, Newfoundland, Saint Paul Island and Cape North on Cape Breton all at the same time, a unique experience in my many crossings. After a short stop in cozy Maskells Harbour on Bras d’Or Lake, another day-night-day run brought us to Shelburne, Nova Scotia, ahead of more lows and strong southwesterlies. We first tried going alongside the Shelburne Yacht Club’s floats, but as the wind piped up, the rear commodore and manager came over and very gently suggested Resolution might be more comfortable at the solid town pier a hundred yards away. They were clearly worried that Resolution’s heavy displacement might break the float away from its moorings—a smart move. Shelburne was another nice place for a lay-day, with its restored historic buildings, shops, restaurants and the hospitality of the yacht club. We were even invited to the Saturday pig roast, but instead set off for Cape Cod and the gentle final leg home.